What if you could use the mysterious power of creation to manifest the invisible into form? What if you could work with the Master Architects of creation? With Sacred Geometry you could do all of this and more; once you step through that dimensional portal the adventure begins! So what is Sacred Geometry anyway? It is the doorway through which Spirit brings energy into the physical plane...manifesting thought into matter. It is the Language of Light... the Language of Spirit that is understood by our higher consciousness. It is the Architecture of Creation. All life forms emerge from these timeless geometric codes. We understand this Language of Light at all levels of our being as these patterns combine both math, which is understood by our logical left brain, and beauty that is appreciated by our creative right brain. Sacred Geometry unites the mind and heart, spirit and matter, science and spirituality. These powerful living forms are containers for energy and are in constant motion creating energy vortexes of color and sound. Each shape emits it's own unique frequency; therefore a cube will have a different purpose or effect than a pyramid or tetrahedron. Sacred Geometry is an evolved intelligence, a collection of experience that can communicate huge amounts of information; this information holds a frequency that assists us to hold our own frequency. 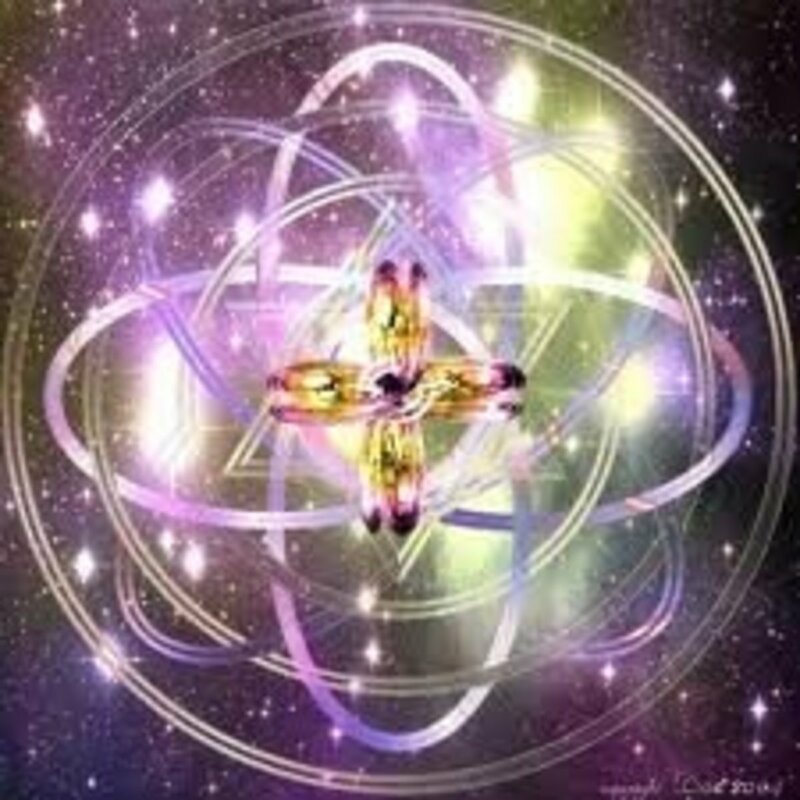 These vortexes are patterns of consciousness that create and unify all things...that create sacred space within. These patterns are inter-dimensional doorways from the void. The lightSOURCE with Hemi-Sync DVD is a wonderful way to achieve stress reduction and improve health and concentration, and may be used daily. I love watching the geometries dance, undulate, and change form! lightSOURCE includes thirteen of the world's most auspicious and elementally powerful geometric designs, including: The Flower of Life, Tree of Life with Seed of Life, Sri Yantra, Endless Knot, Torus, Golden Ratio Spirals, Vesica Piscis, Harmonics of Music and the 13 Strand DNA, Metatron's Cube, Sacred Heart, Icosidodecahedron and Pentagonal Star, Ankhs (Ansate Cross) and the Seed of Life, and The Electromagnetic Field of the Human Merkaba. Sacred Geometry is a very integral part of my life and healing work. People often ask me how I got into Sacred Geometry and I think it is a pretty interesting story. Several years ago I had taken classes in Fifth Dimensional healing and The Reconnection. A class in Sacred Geometry was offered and several people were encouraging me to sign up, but I had absolutely no interest in anything that I couldn't do on myself AND reminded me of math (my most hated subject). With these modalities you learn to work with the Higher Dimensional Frequencies, you learn to actually become or resonate with any frequency you choose. So one day I was feeling adventurous and decided to resonate with the frequency of the 7th Dimension. That was a day I will never forget! The ego cannot exist in that dimension and so the whole day was spent communing with my spirt...and quite a few others. Spending a day without that nagging voice (the ego) was quite delightful. However I was totally unaware of the things that I did that day as my spirit was 100% in control, and was unpleasantly surprised the following day to discover I had signed up and paid for a Sacred Geometry class! I had no idea what had possessed me to pay out a large amount of money for something I really had no interest in doing! However I surmised that my spirit was interested in me taking the class so I stopped complaining and made the best of the situation. I am sorry to say that the class was an even bigger disappointment than I had anticipated. It was the first time these people had taught that class and it was a miserable failure for all the participants. At the end of the weekend we were all feeling lost and stupid, and pretty much clueless about all but the most elemental forms of geometry. Two women from the class and I decided to get together and pool our notes, thinking that surely between the three of us we would come to a better understanding. Unfortunately three sets of garbled notes does not make the picture any clearer than one set. Then the miracle happened. One morning I received what I refer to as a "download" of Sacred Geometry. Hundreds of shapes came into my head one right after the other. It was like watching an old time movie reel where you could see each individual frame of the picture. This download went on for about an hour and when it was done I had total comprehension. I could summon up any shape, know its purpose, and clearly see how to build it in a person's energy field! It was the most amazing thing that had ever happened to me. I felt that I had been given a great gift, and eagerly shared my new knowledge with the other two women. I discovered that not only did I understand it, I was also good at teaching it, thus began my teaching career. In the intervening years there have been days when new shapes pop into my head and I see them being built on a person, then I know that this is a shape that I, or someone I am working on, needs at that time. There are also days when I am entertained by geometry light shows in my head. These are so spectacular that I could never fully explain the beauty of them. Imagine a combination of a lazar light show and a kaleidoscope in full brilliant color, with the shapes dancing and undulating and morphing from one form to another. I was enjoying one of those shows recently when my dog jumped up on me. When I opened my eyes and looked at him I could see all the geometries that made him, like he was a pixilated picture of geometries. I felt like I was seeing into the very heart of nature! In the last year new shapes seem to be coming to me in pairs that work together for whatever specific spiritual advancement is needed at that time. The first "power pair" contained a shape that brought the physical, emotional, mental, and spirit bodies into balance and harmony. This shape feels so good that I call it "The Harmonizer". It brings a feeling of pure Joy within your being, but also tends to leave you feeling a little spacey. However the partner shape is totally grounding...so grounding in fact that for a while after it is activated most people find it hard to move their feet! 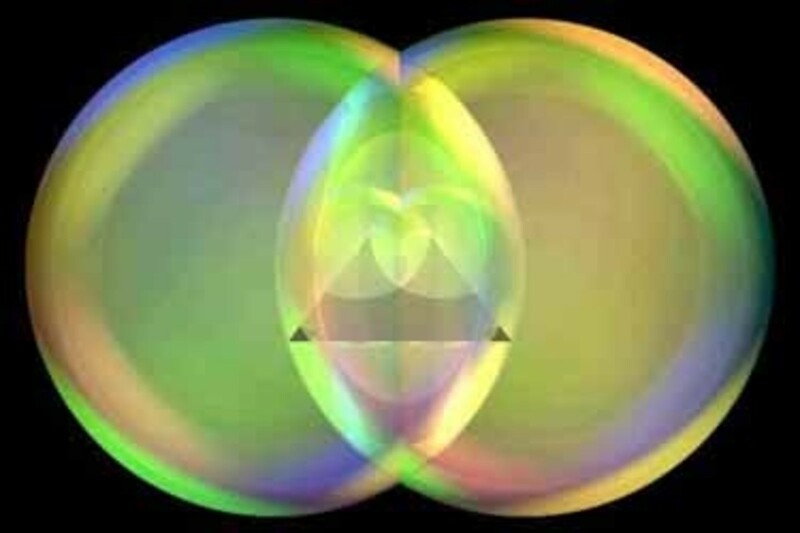 The picture to the right is very similar to this shape only the loops cross at the heart chakra. These continually moving loops open the heart chakra and circulate the heart energy in an endless flow, so that is what I call it "The Endless Flow". This is so wonderful for everyone at a time when we should be getting out of our heads and into our hearts! There is an amusing aspect to this as well. People will literally sway forward as the energy moves to the front of the loop, and then sway back as the energy moves to the back...making it a good thing that your feet are plastered to the ground! A few months later, at a time when it seemed like everyone needed to let go of old energies, I received 2 shapes for that purpose. I called one "The Wheel of Chance", as it assists controlling people to just "let go", "go with the flow", surrender to spirit, and just allow whatever to happen. The result of this was a frenzy of people cleaning out their closets, basements, and garages. They were also letting go of old ideas, beliefs, and habits that no longer served them, and making room for new energies in their lives. The companion shape called "Inner Goddess" is for empowerment, inner power, confidence, and wisdom. This combination of geometries allows you to easily let go of the old and confidently welcome the new...to be present and grounded in the NOW. Recently I received a new pair of shapes. One is for rapid transformations, moving forward in life, and releasing linear time. Time is speeding up and the planet is undergoing many changes; we need to be able to keep up with these changes. 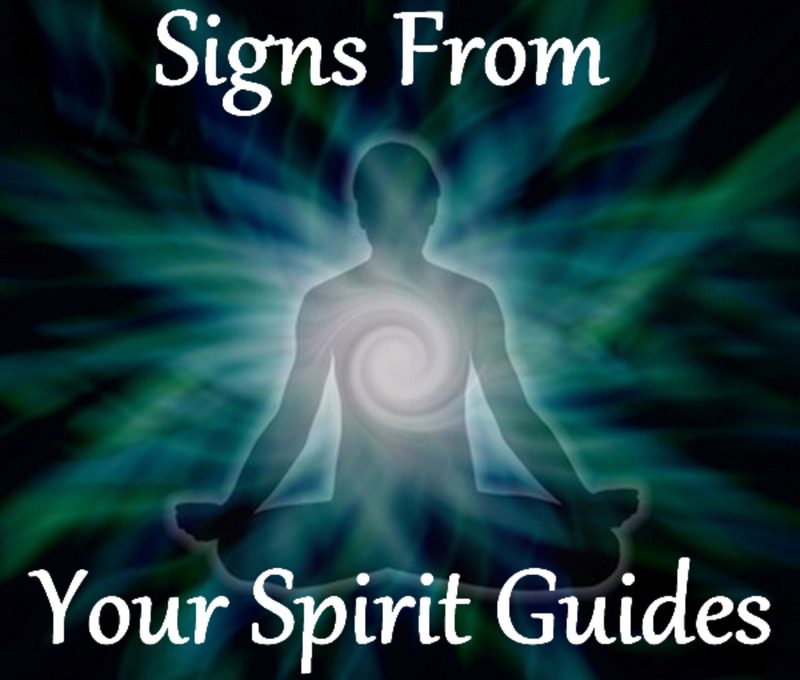 The second shape promotes a feeling of interconnectedness with all things by balancing ego, soul, and spirit, and firmly grounding us to the planet. One of the benefits I have felt from this is being able to tell if my thoughts are coming from ego or spirit, and knowing that it's not a matter of one being good and the other bad, but rather that they each have a specific function in my life. These shapes are so new that many of the effects are yet to be discovered. This picture illustrates how the Tree of Life is built in the energy field. Keep in mind that geometry is a very precise mathematical art, if one of these lines is done incorrectly the frequency is changed and so is the effect. Classes in Sacred Geometry are available at Awakening Wellness and are divided into 2 levels. Level 1 is an introduction in which I teach the simplest shapes such as the Spiral and Tree of Life. In Level 2 the more difficult shapes are taught including the Merkaba. To experience Sacred Geometry you can schedule an Intuitive Vibrational Therapy session with Rhonda at Awakening Wellness. 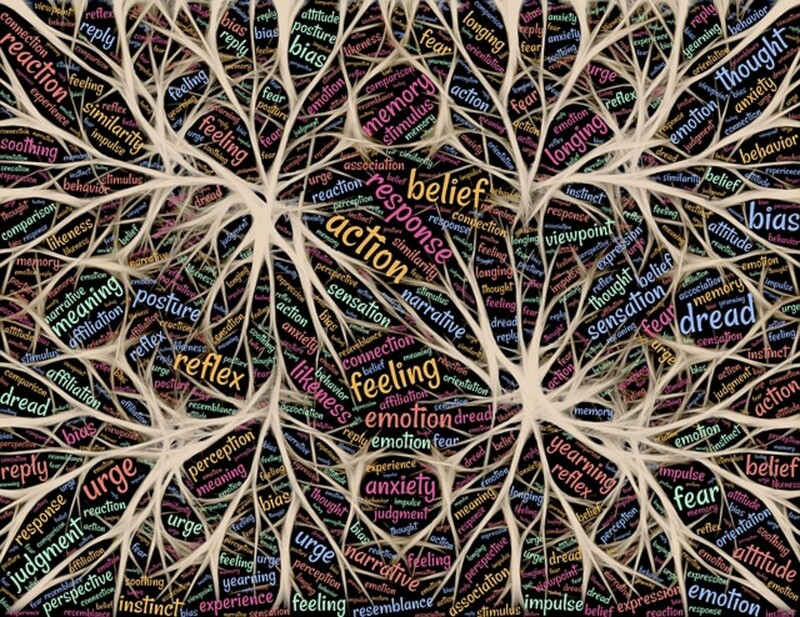 During the session I intuitively combine one or more vibrational therapies that will facilitate your highest healing. These therapies include Sacred Geometry, Fifth Dimensional Healing Tuning Fork Sound Therapy, and Reiki. You have probably heard about the benefits of gazing at geometric shapes such as the Flower of Life, or of the immense power drawn from sitting under a Pyramid or walking a Labyrinth. Now imagine having these forms built and activated in your own energy field. 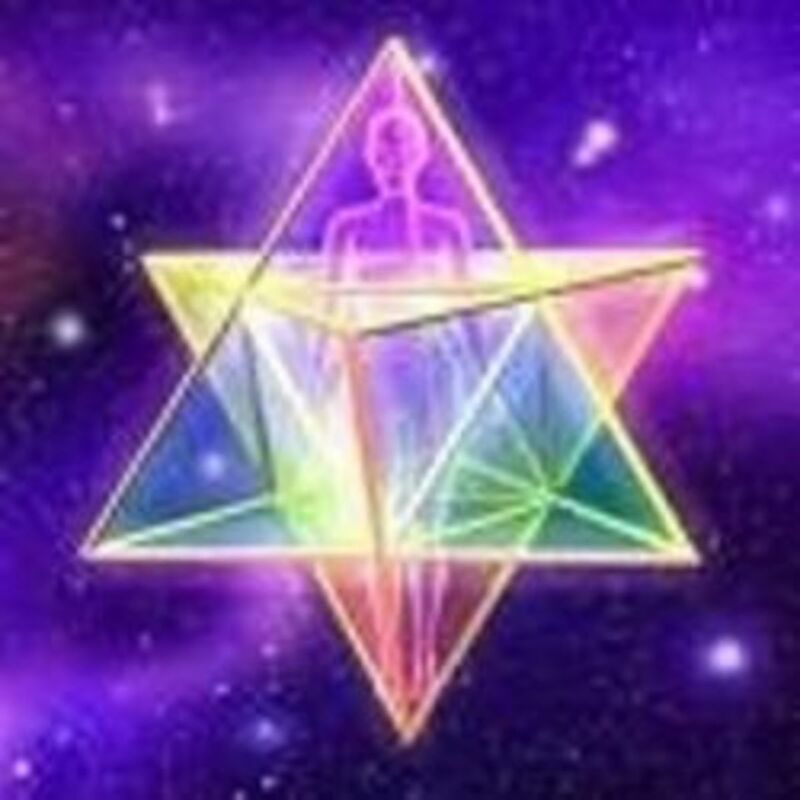 You can release your inner child with tetrahedrons, heal your heart with the Star of David, or even travel inter-dimensionally via the Merkaba. Once a geometric pattern is built and activated it will emit a frequency specific to that particular shape. This frequency causes a specific reaction in your body or etheric field that aids in solving physical, emotional, or spiritual problems. Each shape has a different frequency therefore each shape will cause a different reaction to occur in your body. As there are no limits to the patterns that can be formed from these basic shapes of creation, there are no limits to the benefits. There is a shape that will eliminate back pain in minutes, one that will calm a panic attack, one that opens the 3rd eye, there is even one to release karma. 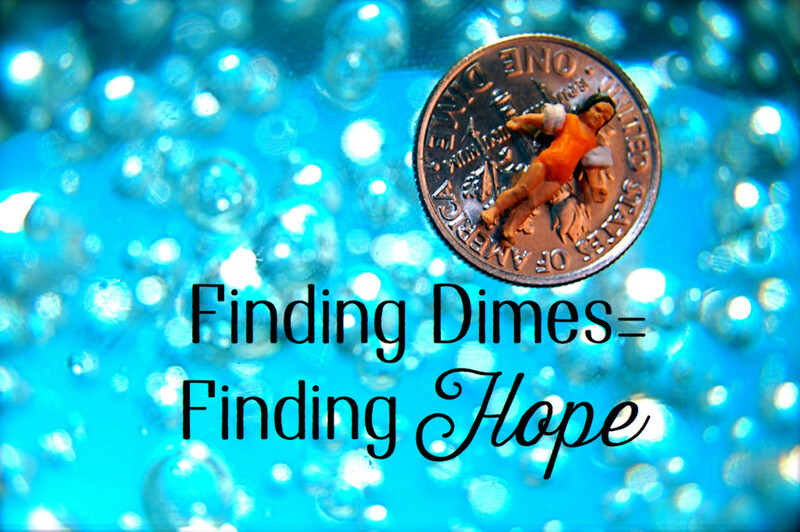 Distance Energy Healing and more! Beautiful visuals depict how Sacred Geometries create the Torus Field that surrounds human beings and the galaxy we live in. See how we can use the energy of these Torus Fields to generate clean energy and Thrive! The Star Tetrahedron better know as the Merkaba, is comprised of 2 opposing tetrahedrons that are spinning in opposite directions. In ancient Egypt the word Merkaba referred to a rotating light that would take the spirit and the body from one world into another. In Hebrew it means chariot of God. In the bible it is the way Ezekiel ascended into Heaven. The word means the spirit/body surrounded by counter-rotating fields of light, and is considered to be a light vehicle for space/time/dimensional travel. 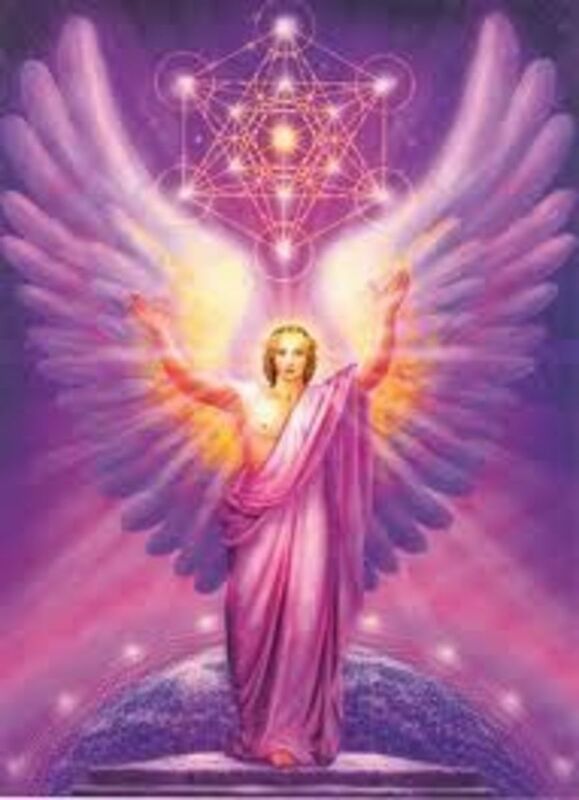 It is the vehicle of Ascension designed to transition you to light body; to assist in the attainment of higher levels of conscious awareness; and to travel or transition between dimensions and realities. Once activated this shape creates an energy field that spreads out in a saucer shape about 55 feet wide. 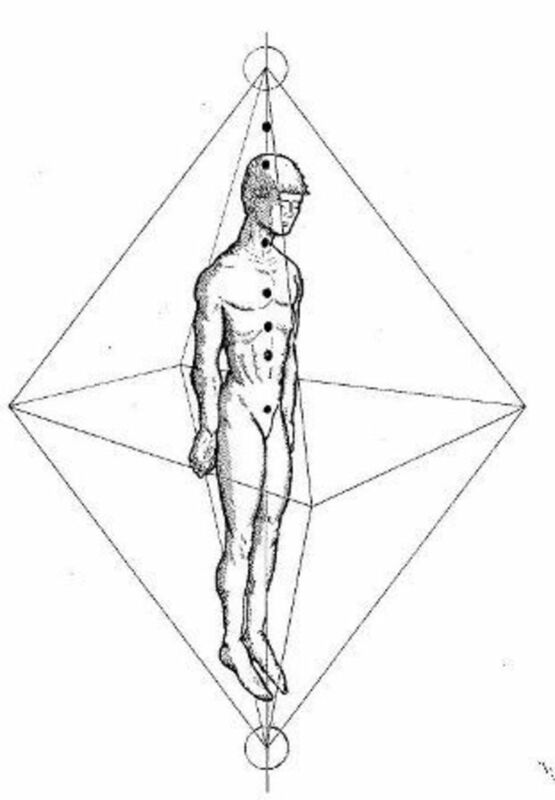 This energy field is capable of carrying ones consciousness directly to higher dimensions. 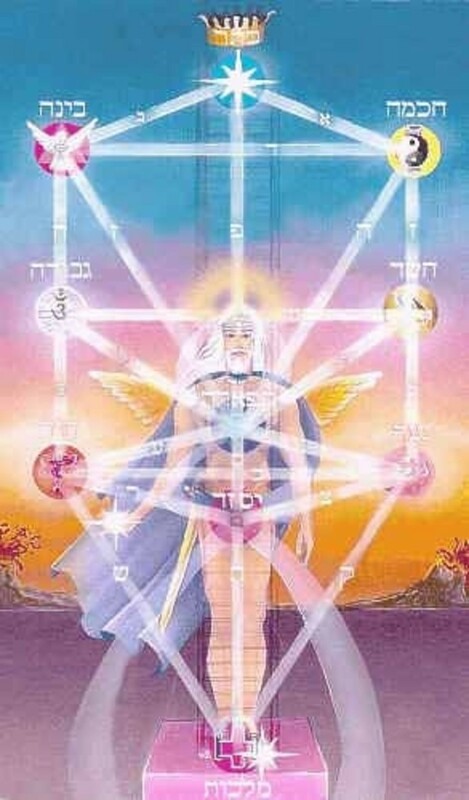 My own personal experience with the Merkaba was one without equal. While learning to build the form I had experienced the awesome energy of the shape, but it wasn't until the day my friends and I decided to allow ourselves time to really "be with it" that I had my true adventure. I first built the shape in my friend's energy fields and allowed them as much time as was needed for their travels. Then it was my turn. Once the Merkaba was built and activated I found myself in what seemed to be space. I remember heading for a whirling vortex (possibly a black hole) and when I came out of the vortex I was in Stonehenge! It must have been a very long time ago as the stones looked new and whole. There was a group of women wearing white robes performing a pagan ritual and to my delight I was allowed to participate. Each of the three of us had a totally unique experience with the Merkaba, traveling to different places. The one thing we all experienced however was the black hole, wormhole, or whatever that whirling vortex was. As fantastic as this story sounds I want to assure you that we were neither drinking nor high on drugs, but rather experiencing the ultimate high while exploring new frontiers in ancient healing. These Language of Light geometric shapes are collections of experiences of awakened beings who evolved into Sacred Geometry symbols. They exist in their sphere of activity just as we exist in our bodies. These beings exist in a language system or a geometric system. For several months I had been thinking about how nice it would be to have a shape that would help bring the flow of abundance into my life and a few weeks ago I received such a shape! Actually I received two shapes as this one has a partner shape for releasing what you no longer want or need in your life. What is really exciting is that these shapes work with intention...you intend to first release 16 things and then receive 16 new things (of your choosing) into your life! I released things like worry, fear, and tension, and exchanged them for gifts of love, joy, wisdom and many more. These shapes allow the recipient to be a true co-creator of their own life! Yantra Mantra is a fusion of sound, movement, color and form that nurtures the soul, activates personal transformation, facilitates mental and physical relaxation, and leads to holistic awareness...culminating in a uniquely deep state of peaceful awakening. This 2-Disc set contains 10 beautiful Mantras that are brought to life by 3 Dimensional living Mandalas (classic Sacred Geometries). There is also a Yantra Mantra screen saver and meditation tool, information about the mantras and an MP3 soundtrack with Deval Preval's beautiful voice. Then Energy of the Human Angel! Recently I received a new set of "light codes" that form the Diamond Grid. The diamond energy helps us to maintain a state of balance with all of the Earth changes happening now. 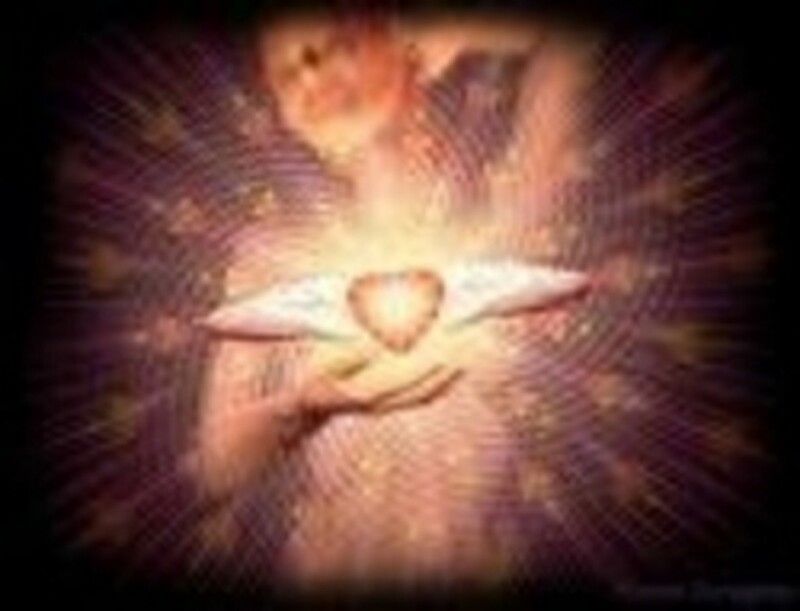 The Diamond Grid engages the heart center thereby awakening the light within you. This energy brings change and transformation by realigning our chakras and allowing our bodies to hold more light. This picture to the left is a 2 dimensional view of the Diamond Grid which is an octahedron or 2 pyramids, 1 pointing up the other pointing down and attached at the bases. As I build this large octahedron around your body, a whirling vortex of golden light is created that stimulates creativity, initiates healing, and fosters love and compassion, as it balances and evolves your heart energy. 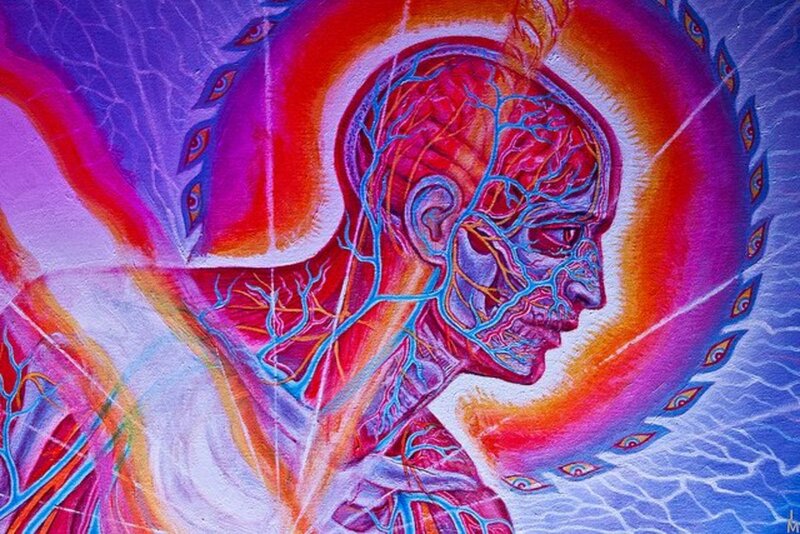 The four center points at your root chakra stabilize you, the point below your feet connect you to the changing earth, and the point above your head is an antenna magnetizing spiritual light. 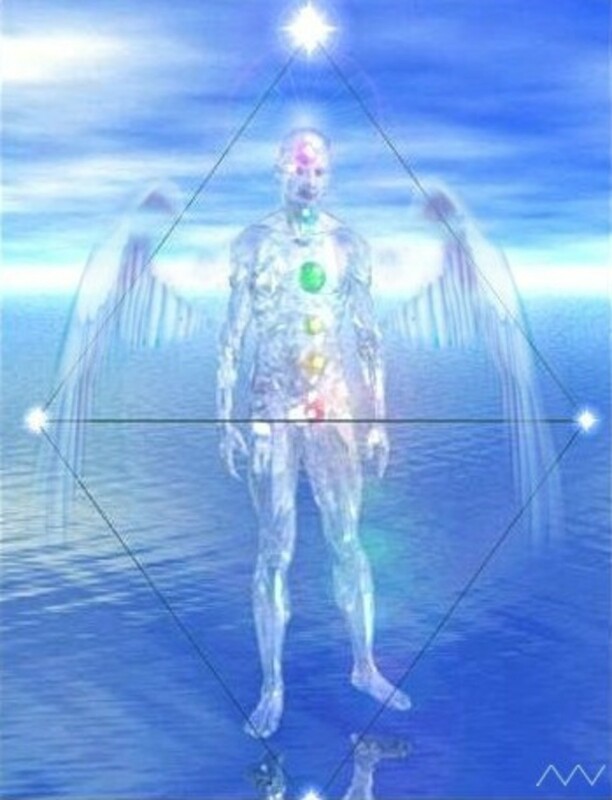 When activated theses codes bring in the Diamond Light energy of the New Earth and the evolving Human Angel! What Are Lightworkers and What Do They Do? Comments or Questions About Sacred Geometry? Lovely lens, tons of information. I actually have a ton of questions... but I realize that no single page could answer them all. I have always felt an aversion to math (relating to your initial reaction to geometry). But, I do find "order" - if that's the right word - in geometry, and so I feel I would like to learn more. I'd love to see how it could help me personally in my life, especially since I have a few things I sure would like to release so I can move forward! Alas, where I live, I haven't located anyone who I can talk to about this. Very interesting lens! That is so interesting.. i also get glimpses of these shapes! Is there anywhere you have published all the geometric shapes you've been shown and their meanings? I'd love to find out more about the ones you have been shown! Thank you for sharing this info! love to do the class but i'm not in the US! What a wonderful, informative and impressive lens! I love the way you introduce the subject of sacred geometry by personal experience. Despite my bad experiences with geometry in school I have an intuitive grasp of some forms that come spontaneously into my life through inner journeying... like the spiral, the merkaba, etc. now I can embrace them even more fully! Thank you! I am encouraged to go learn more about them! Great lens! Very interesting material! I love your lens, the are all filled with great information. My first sprinkling of angel dust on this lens has long worn off so I am back once again to scatter a little more. It is my quest today to bless all the lenses which I blessed in October of 2010. You are on this list. Returning with a fascinated once again blessing! I've often wondered about sacred geometry and came to the right place to learn and to GET it, very well done! ***** and an angel blessing 4 U! Very nice lens and a fascintating topic. Excellent Lens. Very Very Interesting. Very very Interesting reading. Need to let it soak in to comment back. Love and grace. God bless. This is exciting work you've been given to do. I've come to the point that we all have our own systems to discover and work with that are as individual as our fingerprints. It sounds like you've found yours! I've taken a short workshop in Light Language but I haven't really done much with it, so apparently, although interesting, it's not really my thing to use, at least not in the way it was taught. Happy Valentine's Day! You do create the most beautiful awe inspiring lens. Thank you. Awesome, need to digest some of this! Wow, As I read about it , I was in awe. It described the place I am at in my life to a tee! It is really still so weird for me. To see things in my minds eye,I almost expect them to mean nothing or to be rubbish and they turn out to be quite profound at times. 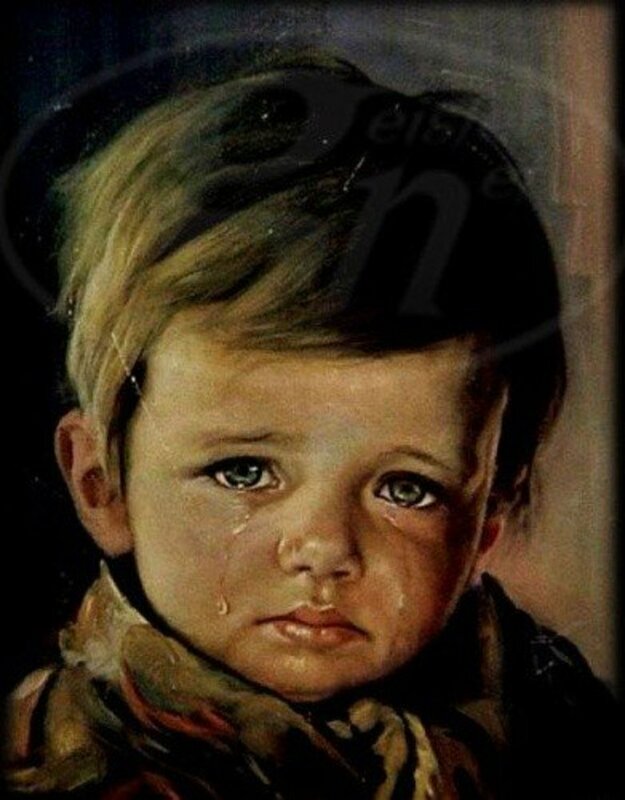 About 3 months ago, I saw a phrase and relayed it to a friend, I was not sure if it was latin or some other language, I only know English, He translated it and i was shocked. It translated to somehing similar to the sun provides/Prevails Holy Domains. Still don't know what it means but, Out of all the words in all of language?! I am a newbie but, now I have something to research. I often see things or foreign words form in my mind and i have no idea what they mean, This has been the most persistent. @anonymous: It sounds like you are seeing the diamond light grid. 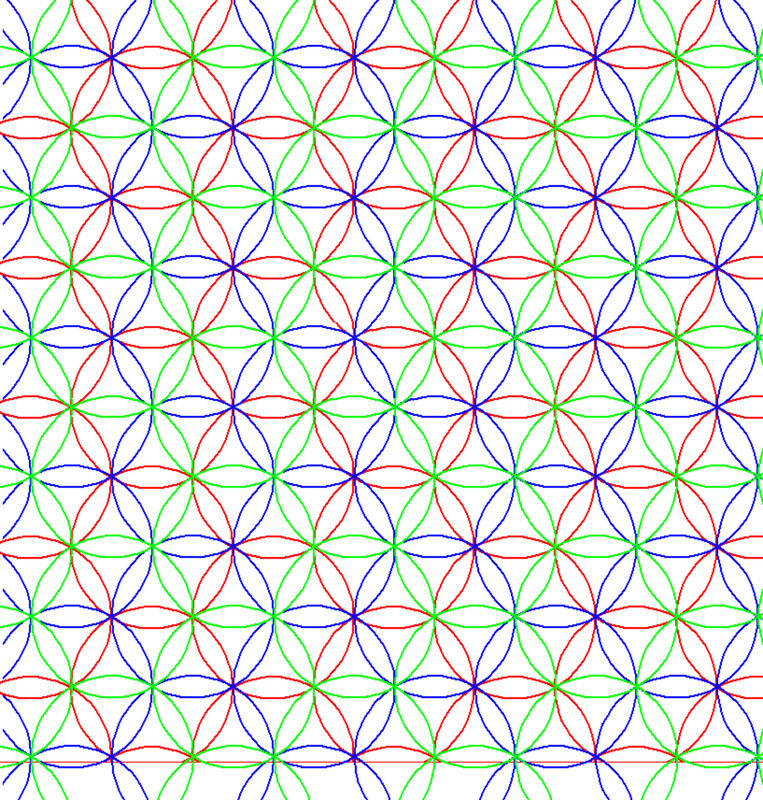 I keep having a vision of two pyramids, One right side up one point facing down,Directly above and below spinning in opposite circular motions , not overlapping but bottoms touching. Does anyone know what this signifies?? Congratulations on another Angel Blessing. Great lens - I haven't been back in a while, well written and researched. Returning to bless this enlightening lens! Blessed once again by a squid angel...what beautiful thoughts you have placed within this article. Have a wonderful morning. I find a lot of peace here, and much joy. I enjoyed this and was very teachable. Thank you! i used to add a sacred geometry section to the math classes i taught. beautiful lens. Thank you for an interesting and intriguing lens. I've heard of sacred geometry before (very briefly) but more in connection with crop circles but this healing aspect is very interesting. I laughed out loud at your story of how you got to a sacred geometry class! Reading your experiences is pure delight that has opened my heart and imagination. Rhonda, thanks for being YOU! I love the picture on the Diamond Light Grid! This is so interesting. I am wondering now if I could create line art of these sacred shapes for people to color that would be as inspiring and useful, if not more so, than the mandala coloring pages. Thank you for sharing this information and your experiences. To a fellow sound healer - thanks for this lens on sacred geometry. Well done. Thank you for the blessing and congratulations on the wings! Fantastic lens, blessed by a new squid angel today! Wow - I can see why you teach this! I have had a class too but you explain it in a much clearer way! Thanks for this top notch lens 5Stars and a fav. I find your lens to be very interesting. 5 Stars. I sometimes see shapes, geometric and crystalline, which I suppose is also geometric. What I see is almost always a flow from left to right. Occasionally a shape will be static, but they generally begin to grow and expand becoming more and more complex before they flow out of sight. It is fascinating, but I have no idea what it means. I am definitely coming back to check out your links and your web sites. Thanks. Wow, what a great lens. I'll definitely have to come back and explore all of the links. I love this stuff. You have a great lens. I like working with sacred geometry ,it's a lot of fun. You have so much information here I'll be back to read more. 5 stars from me. Thanks for putting this lens together and all your time to make it great. What a superb lens!! I'm absolutely blown away, and all the ideas on here of how the physical plane is just the tip of the iceberg ring so true!! A wonderful place to be!! you've got some really cool products on your cafe site. I have much to learn. Your own story really makes the material less strange and more human. I see and feel shapes in my own healing practice. I also like to add sound and vibration. Great lens! Welcome to the Spirituality Group! Great lens. As the originator of Crystalline Consciousness Technique which uses sacred geometry, I know from experience there's always more to discover! I enjoyed this lens. But I'm still confused - do you just visualize certain forms? What was the single most useful book you found for learning? Unusual, this is the kind of information that is not found on every corner. hard work. I watched The Last Mimzy with my ten year old son and we both loved it. Great lens on a subject I had never heard of. Interesting stuff! My father, who was a mathematician, always said math was the only true universal language. Hi, Rhonda. You've done a wonderful job here explaining sacred geometry and giving it a personal touch. 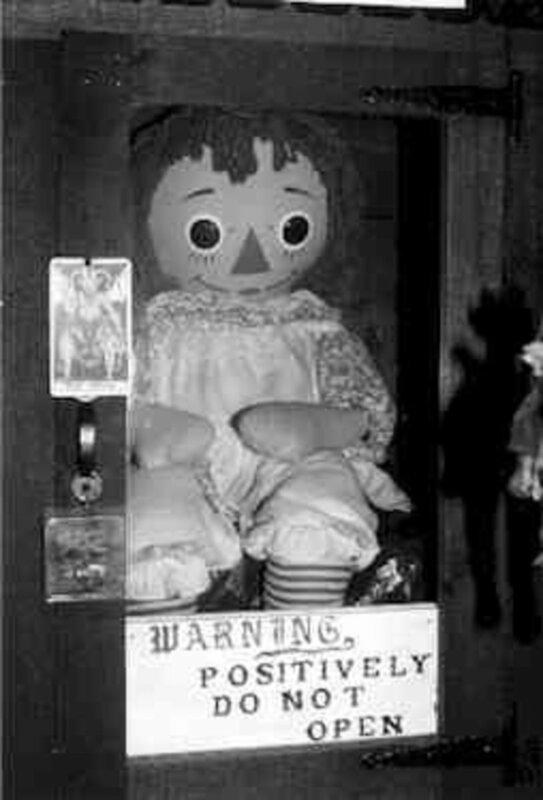 I've always been fascinated by it, but never had the chance to study it. This is a 5* lens that I'm pleased to Fav as well! Very nicely done, very intreasting . This is really fun! Allowed me to escape into another state of being while I was reading, Nice energy, colors, shapes...doorways. Great lens; 5 stars. Feel free to join The Symbolism and Design Group too! A truly interesting and informative lens! Thanks for sharing these concepts - and your passion! 5 stars! Very nicely done! I am a fan of yours anyway...I really like the energy you put into your work! Very nice Rhonda. There are great resources here that are organized clearly. I thoroughly enjoyed reading your journey into Sacred Geometry. I look forward to more fully exploring all of these resources. Very nicely done! You did a great job explaining it all and gave excellent resources for follow-up!